Yes, I used a breast cancer awareness fundraiser as an excuse to buy more pink hair tinsel and glittery Jamberry nail wraps on Amazon! Sprint to my Photography Field of Flowers blog if you want to read about my experience at the 7th annual DE-feet Breast Cancer 5K yesterday. I stopped to smell (and photograph) the roses while waiting at the start line. 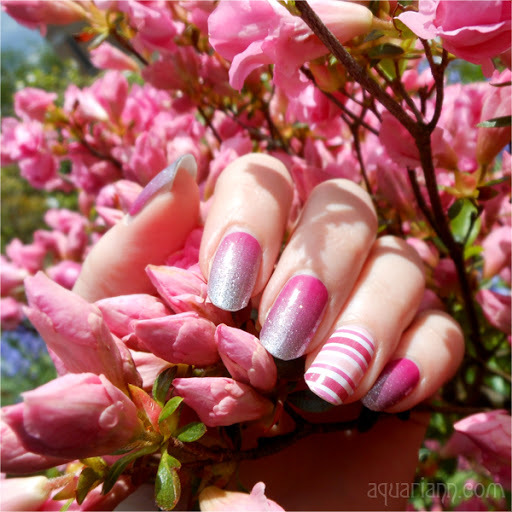 The Sunday before the race, I saw this pink flower bush on my way to a Wizard of Oz ballet and had to pose with it for Manicure Monday. Anyone know the type of blooms?